FHWA-PL-02-009 2.Government Accession No. 3.Recipient's Catalog No. 7. Author(s) Harry Caldwell, Randall K. Halvorson, Christina Casgar, Gene Cleckley, Oscar de Buen, Jeff G. Honefanger, Ysela Llort, Michael D. Meyer, Leo Penne, Gerald Rawling, Garry Tulipan 8.Performing Organization Report No. The purpose of the international scan was to investigate the issues, constraints, opportunities, and challenges faced by the European Union (EU) in developing a policy of open boundaries and what strategies it uses to implement the policy. The panel met with government representatives, terminal operators, logistics providers, and shippers to gain a broad understanding of how the EU has attempted to develop a common market, and how the private sector has responded. The group met with various industry and government representatives from the Netherlands, Italy, Germany, Austria, and Switzerland, and with representatives of the European Commission in Brussels. Findings from this study could be relevant to the United States, Canada, and Mexico in developing a common North American market. These lessons also are important for national and subnational investment decisions relating to enhanced freight movement. Case studies of public/private sector freight investment initiatives in the EU may be of particular interest. Intermodal freight movement, European Union, freight logistics, mode share, terminal, interoperability. The FHWA's international programs focus on meeting the growing demands of its partners at the Federal, State, and local levels for access to information on state-of-the-art technology and the best practices used worldwide. While the FHWA is considered a world leader in highway transportation, the domestic highway community is very interested in the advanced technologies being developed by other countries, as well as innovative organizational and financing techniques used by the FHWA's international counterparts. The International Technology Scanning Program accesses and evaluates foreign technologies and innovations that could significantly benefit U.S. highway transportation systems. Access to foreign innovations is strengthened by U.S. participation in the technical committees of international highway organizations and through bilateral technical exchange agreements with selected nations. The program has undertaken cooperatives with the American Association of State Highway Transportation Officials and its Select Committee on International Activities, and the Transportation Research Board's National Highway Research Cooperative Program (Panel 20-36), the private sector, and academia. Priority topic areas are jointly determined by the FHWA and its partners. Teams of specialists in the specific areas of expertise being investigated are formed and sent to countries where significant advances and innovations have been made in technology, management practices, organizational structure, program delivery, and financing. Teams usually include Federal and State highway officials, private sector and industry association representatives, as well as members of the academic community. The FHWA has organized more than 50 of these reviews and disseminated results nationwide. Topics have encompassed pavements, bridge construction and maintenance, contracting, intermodal transport, organizational management, winter road maintenance, safety, intelligent transportation systems, planning, and policy. Findings are recommended for follow-up with further research and pilot or demonstration projects to verify adaptability to the United States. Information about the scan findings and results of pilot programs are then disseminated nationally to State and local highway transportation officials and the private sector for implementation. This program has resulted in significant improvements and savings in road program technologies and practices throughout the United States, particularly in the areas of structures, pavements, safety, and winter road maintenance. Joint research and technology-sharing projects have also been launched with international counterparts, further conserving resources and advancing the state of the art. For a complete list of International Technology Scanning topics, and to order free copies of the reports, please see list on the facing page. The purpose of the international scan was to investigate the issues, constraints, opportunities, and challenges faced by the European Union (EU) in developing a policy of open boundaries and to learn what strategies it uses to implement the policy. The Federal Highway Administration (FHWA), the American Association of State Highway and Transportation Officials (AASHTO), and the National Cooperative Highway Research Program sponsored the scan. Members of the scanning team represented diverse interests and concerns for both national and international freight movement in North America. In addition to FHWA and AASHTO officials, the panel included representatives from the national ministries of transportation for Canada and Mexico; the departments of transportation for the States of Florida, Minnesota, and Ohio; the metropolitan planning organization (MPO) for the Chicago metropolitan area, the Foundation for Intermodal Research, and a university professor in transportation planning and policy. These panel members are experts in the areas of policy, planning, regulatory enforcement, freight logistics, and economic development. The panel elected to meet with government representatives, terminal operators, logistics providers, and shippers to gain a broad understanding of how the EU has attempted to develop a common market, and how the private sector has responded. 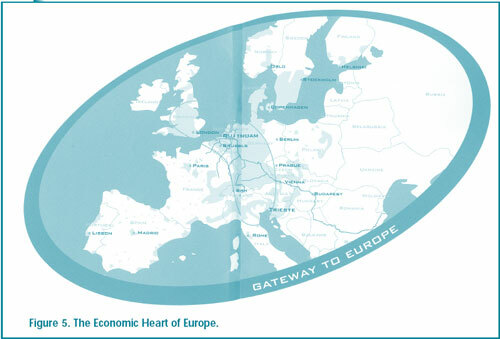 From May 28-June 10, 2001, the panel met with representatives from the national ministry of transportation for the Netherlands and from the European Commission in Brussels; intermodal rail terminal operators in the Netherlands, Italy, and Switzerland; port officials in the Netherlands and Italy; managers of the Frankfurt Airport; freight logistics companies in the Netherlands and Germany; and the president of an Austrian trucking company. Because of limited time, the panel did not meet with other government agencies and private companies that could have provided a broader perspective on the issues facing the development of a common European market - groups such as national railways, inland water or coastal shipping firms, and the ministries of transportation for other countries. In addition, the panel was unable to meet with nongovernmental organizations representing environmental protection and sustainability issues. Lessons from the study could be very relevant to the United States, Canada, and Mexico in developing a common North American market. In addition, these lessons are important for national and subnational investment decisions, as related to enhanced freight movement within individual countries, serving primarily the domestic market. For example, case studies of public/private sector freight investment initiatives can provide useful lessons on how such initiatives could be undertaken in North America. Globalization of the supply and distribution chain has created new opportunities and challenges for the EU. The strategy of developing open borders, combined with generally favorable economic conditions, has resulted in substantial increases in passenger and freight movement in Europe. The increased economic activity has resulted in increasing traffic volumes, especially in truck movements. Not surprisingly, congestion on the road network and access to intermodal terminals/ports has become a critical issue, especially in urban areas and at critical natural geographic barriers, such as the Alps and the English Channel. Given the historical context of having many different national transportation systems (often designed purposely to limit cross-border movement for national defense purposes), the interoperability within and between modal systems in Europe has also been, and will continue to be, a major challenge to the European Community. Importantly, transportation policy at the EU level, as well as in the Netherlands (and reportedly in other European countries), is linked to environmental/ sustainability/energy issues. The importance of economic competition, especially in a global market, has, however, raised economic development/productivity/accessibility to a comparable level of importance. Europe has responded to the challenges of developing a continental economic market and a supportive transportation infrastructure in a variety of ways. The panel examined four levels of response. Private sector (shippers/truckers/logistics companies/terminal operators): The private sector (as broadly defined above) has responded to the market conditions created by the EU/national government regulatory context. It has focused on rationalizing services and operations with strategies to increase economies of scale (e.g., larger ships and ports, block trains/unit trains/shuttles, freight villages, intermodal consolidation terminals, etc.) Because many freight operations are capital intensive, there seems to be a trend toward more hub operations, which require large investments in infrastructure and information technology. Intermodal freight movement (which currently has a very small market share) has been an increasingly important strategy in handling increased freight movement and is expected to achieve even more. Private firms have supported and lobbied for greater relaxation of government obstructions in the general market context (e.g., customs regulations), but have sought to keep government out of areas that directly affect their own operations. Importantly, however, the implementation of EU policies, guidelines, and regulations in many policy issue areas is the responsibility of member states. The major focus of initial EU efforts was on developing free competition and interoperability of transportation systems, including promoting the development of necessary infrastructure and consistency in member nation laws. In addition, the EU identified priority investment projects that would best enhance the connectivity and interoperability of the European transportation system. These projects originally focused on infrastructure development, but more recently have included system management and intelligent transportation system (ITS) integration. The EU has developed a Common Transport Policy that emphasizes a goal of sustainable mobility. There is considerable current debate, however, on how to link transport goals and sustainability/energy goals. The major policy approach has been to establish target market shares for modes (e.g., the mode share will be what it was in 1998). In particular, there is a high level of expectation attached to the ability of the national rail systems to shift freight movements away from trucks, with support from the coastal shipping industry (and, in the case of the Netherlands, the inland waterway system). The EU provides some funding for projects and feasibility studies, in particular to leverage contributions from other sources. The EU investment projects are prioritized from the perspective of how important the projects are to a coordinated European transportation system. Many of these projects have important benefits to freight movement. The EU transportation funding is part of the total EU budget, which comes from customs revenues and value added tax (VAT) revenues (which are in addition to what was raised before the EU was created). The panel was told that the buy-in on the EU priority projects from member governments and from the private sector has been slower than expected because of a slowdown in the economy, an overestimation of private investment interest, and environmental concerns with some of the projects. However, in some cases, EU member nations have used government funding to reduce the risk to private investment. The future role of EU governance is a key issue currently being debated; the respective roles of the EU versus member nations have not been agreed upon. As noted above, member states must agree to implement EU policies, which constrains EU-wide implementation of policies that are controversial (e.g., road pricing). Perhaps of most importance, however, the EU has been advantageous for transportation in its collective efforts to reduce cross-border obstacles and in raising transportation issues to international and national political levels. Public sector - EU member nations: The panel did not meet with representatives of national governments, except for those of the Netherlands. The following observations were obtained from discussions with the other groups the panel met with during the scan. EU member nations are responsible for implementing EU policies and directives. There are differences of opinion on what is appropriate for a common "European" purpose. Member states are often concerned about the position of their own industries in the context of the EU, and thus it is often difficult to support change because of institutional issues characteristic of each individual country (e.g., unions and national railway prerogatives). Some member nations seem to use the same policy approach as the EU of targeting market shares in national transport policy. In the case of the Netherlands, this approach is designed to increase market share for inland water transportation and railroads. Public/private partnerships also have been used to decrease the market share for trucks. In most cases, the public role in these partnerships has been to invest in freight infrastructure - intermodal terminals, ports, and rail corridors - and to provide loans for operations. There seems to be a trend, encouraged by EU policy positions, of separating the ownership of the freight infrastructure from those responsible for operations. The mode split and pricing approach to transportation policy is a tacit recognition that governments cannot "build their way out" of the transportation problems they are facing. Public sector - local governments: Several examples were found where local governments have financially supported the development of freight infrastructure. Although several of these examples were unique to the situations local officials found themselves in (e.g., Rotterdam as the gateway to Europe or decommissioned acreage at a U.S. Air Force base in Frankfurt becoming a major economic generator for the city), local officials were able to successfully link economic development objectives with broader community goals. The region's competitive advantage in a global, or at least a European, market was a key driving force in several of the examples seen. Global market logistics rely heavily on the performance of infrastructure owned and operated by the public sector. Understanding the motivation of logistics decisions and their local implications is a critical point of departure for a national or multinational effort on fostering trade. Identifying freight bottlenecks, solving them, and establishing market conditions that provide free access should be an important focus of regional, state, national, and international planning/policy efforts. One of the most important concerns of freight transport users, and thus of transport officials identifying improvements to this system, is the reliability of service or trip-making. Speed of travel is important, but the results of service strategies examined as part of this scan suggest that system reliability is even more important. This need has significant implications on the performance measures used in system monitoring and in project prioritization. The EU illustrates the importance of having an international and national policy on investment in freight transportation. Public and private investment in freight facilities has occurred, and continues to occur, in Europe. Public investment is designed to act as a catalyst for private investment in services and facilities that could provide important public benefits. In some cases, such investment is being considered from a true "systems" perspective (i.e., improvements are being made in infrastructure that is outside of a nation's boundaries, but that will clearly benefit that nation's industry). Public investment targeted at freight movement should adopt a framework in which the private sector is provided incentives to choose what is best for their business within the context of achieving public goals (e.g., economic development, sustainability, etc.). This notion was portrayed by the Europeans as making market-driven policy decisions within a "public good" context. Interestingly, a long-term public policy focus in this context was around 10 years, whereas the private sector focus was at most 5 years. The focus of the overall policy was to make the best use of existing transportation options (e.g., rail and inland water transportation) before developing new transport networks. As one Dutch official stated, transportation system management strategies come first, followed by pricing strategies, and finally actions to construct new infrastructure. Public budget and financing mechanisms for funding freight projects exist in the EU, although, as a percentage of total transport system investment, they are quite limited. No debt financing was found in any of the examples discussed, and for the very largest projects (e.g., the Betuwe corridor) little private investment occurred up front. Even so, the level of public investment in freight facilities and services seems far greater in Europe than in North America (even with projects like the Alameda Corridor in the United States). A critical role for multinational efforts is to foster open competition and open borders. Free access allows the market to take advantage of productivity economies and results in market-placed decisions. The European experience, however, suggests that there might have to be different market incentives and rules for different segments of the transportation system (e.g., intermodal terminals, national rail service, inland water, etc.). The EU has served as an important forum for establishing consensus on strategies for creating an openly competitive market in Europe. Such a forum provides the institutional framework for developing a common message among government agencies and among important stakeholders as it relates to economic competitiveness. In addition, such a forum has raised transportation issues to the level of national political discourse. Interoperability and consistency in national laws and regulations are important areas for multinational concern. This leads to a concern for consistent application of information technology strategies across borders. Although important, however, these issues should not overshadow much broader concerns for market-driven policy and decision making. In addition, the EU experience suggests that issues such as language compatibility, signage consistency, and handling of paperwork precede information technology concerns. In the case of European freight movement, the trucking industry seems to have dealt with these problems before the rail industry. The EU has incorporated human resource development/training as an important component of any public/private initiative aimed at improving freight movements. This work has been done primarily to raise the quality of life of the communities that are affected by freight facilities and operations. Collaboration with a research center (e.g., the Intermodal Transport Research Center in Hamburg) to monitor the response of intermodal freight to national and EU policies. Examination of the results of EU rationalization of transportation infrastructure. For example, what happens to ports or terminals when the EU's transport plan suggests that a smaller number of such facilities will better serve EU purposes? Comparison of North American and EU productivity in freight transportation, and the differing criteria for investment. Review of existing forums/mechanisms for North American Free Trade Agreement (NAFTA) discussions to see if there are more effective means of trilateral cooperation in regard to transportation decisions. For example, how should improved water transportation opportunities be incorporated into ongoing discussions? Are there different models for institutional decisions in North America? How do we get trade/commerce groups involved in these discussions? Continued monitoring of EU experiences with road pricing and relative success in fostering mode shifts. Investigation of the role of the MPO in freight transportation, especially issues that have national implications. What are the expectations of the MPOs with regard to such issues? Investigation of public/private partnerships for freight improvement projects. How can public investment be related to public benefits? Examination of adopting a systems perspective on freight transportation that includes not only a conceptual model, but also reflects performance measurement. Consideration of the role that technology innovation can play in international and national trade markets, including not only physical modifications to vehicles or networks, but also the increasingly important role for information technologies. Examination of global freight flows, and the relative importance of different transport flows to global trade movement. "Without transport, it (the Single Market of the Union) would exist only in name. Without efficient, compatible, sustainable transport systems and operation, it obviously will not flourish." One of the important trends in international commerce over the past decades has been the creation of common economic markets through the relaxation and elimination of cross-border barriers to passenger and freight movements. NAFTA is an example of how several nations are developing such a market. The EU, another such example, has more years of experience in developing governmental and private sector strategies as part of a transition to an open borders policy. The purpose of this international scan was to investigate the issues, constraints, opportunities, and challenges faced by the EU in developing an open borders policy, and the strategies used in implementing this policy. In addition, the scan was interested in identifying how the transport industry is responding to this changing market. Freight logistics and governmental strategies to foster international commerce involve very complex and specialized processes. Understanding the motivation for logistics decisions and their response to different economic influences is an important point of departure for investigating how multinational freight flows will reflect the characteristics of economic markets. This scan purposely focused not only on governmental policies and the steps in their development, but also on how freight terminal operators and users of the transportation system have responded to economic incentives/disincentives. The scan panel reflected a wide range of interests and concerns regarding both national and international freight movement. The FHWA and AASHTO jointly sponsored this scan. In addition to FHWA and AASHTO officials, the panel included representatives from the national ministries of transportation for Canada and Mexico, the departments of transportation for the states of Florida, Minnesota, and Ohio; the MPO for the Chicago metropolitan area, the Foundation for Intermodal Research, and a university professor in transportation planning and policy. These panel members represented a diverse set of interests and expertise in the areas of policy, planning, regulatory enforcement, freight logistics, and economic development. The panel targeted selected government agencies, terminal operators, logistics providers, and shippers to gain a broad understanding of how the EU has been attempting to develop a common market, and how the private sector has been responding. During the period May 28-June 10, 2001, the panel met with representatives from the national ministry of transportation for the Netherlands and from the European Commission in Brussels (Directorate General of Energy and Transport); intermodal rail terminal operators and service operators in the Netherlands, Italy, and Switzerland; port officials in the Netherlands and Italy; managers of the Frankfurt Airport; freight logistics companies in the Netherlands and Germany; and the president of an Austrian trucking company. Given limited time, the panel did not meet with other governmental agencies and private companies that could have provided a broader perspective on the issues facing the development of a common European market, groups such as national railways (especially in Great Britain where the largest experiment in privatization has run into difficulty), inland water or coastal shipping firms, and the ministries of transportation for other countries. In addition, the panel did not meet with nongovernmental organizations representing environmental protection/sustainability issues. Lessons from this experience are very relevant to the United States, Canada, and Mexico in developing a common North American market. In addition, these lessons are important for national and subnational investment decisions as they relate to enhanced freight movement within individual countries, serving primarily the domestic market. For example, case studies of public/private sector freight investment initiatives as found in Europe can provide useful lessons on how such initiatives could be undertaken in North America. Appendix A contains the questions that served as the basis for each of the European visits. Appendix B lists the tour schedule and contact information for the European representatives. Appendix C contains biographical and contact information for the scan team members. Before presenting the results of the scan tour, it is important to illustrate the main differences between the EU and North America. As shown in Tables 1 and 2, there are some important distinctions between the two. It is not surprising that the extent of road and rail track is much greater in North America than it is in the EU given its much larger land mass. The larger expanse of the United States, for example, results in the significantly greater average rail and truck trip distance and greater rail mode split (measured in tonne-kilometers) shown in Table 2. This table, however, indicates a substantial carriage of freight by truck and short sea transport in the EU. Note: At the time these data were being collected, the rate of exchange for the Euro was 1.2 to 1 U.S. dollar. *Reported in EU Statistical Pocketbook as number of km per tonne. (Note: 1 ton-mile = 1.46 tonne-km). The respective role of governments and of the private sector is an important institutional difference between the two markets. In the United States, for example, freight rail services have traditionally been owned and operated by private firms (Conrail notwithstanding). In Europe, national railways, in various ways connected to national governments, have been the norm. European governments tend to be much more active in central planning than the U.S. national government not only because of the historical development of governance in both, but also because of the relative size of the countries. In Europe, although France and Germany tend to have a large influence on the economic market and on what happens in the EU, many other countries can play pivotal roles in defining overall directions. In North America, the United States, because of its size and economic position, has the greatest level of influence. Other differences between the EU and North America identified by those interviewed include a more fragmented customer base in Europe, language/cultural differences, different transport and labor regulations, the use of VAT and customs revenues for the EU budget, and historically different payment methods and financing schemes. Perhaps the largest difference between the two economic markets is the large number of countries involved and the history that has defined their relationship. With the North American market consisting of only three countries, the level of complexity and institutional organization that might be needed for coordinated action is much less than what one would expect for a 15-nation economic and political union. In addition, a long history of European conflict and competition has resulted in a centuries-held perspective of national borders as protection against incursions from neighboring countries. The removal of customs at the national boundaries, the move toward a common currency, and the many other initiatives that have changed centuries of national prerogatives in Europe represent a truly remarkable development in European, if not world, history. The past 50 years have seen dramatic change in Europe, including how the Europeans see themselves and their role in the world. Starting with the Treaty of Paris in 1951 that established the European Coal and Steel Community to the latest Treaty of Nice, Europe has evolved institutional relationships and frameworks that have created an economic powerhouse. Important throughout these past 50 years was the creation of an internal economic market that provided barrier-free access to all member states. Those interviewed during this scan used terms such as "harmonization" and "liberalization" to describe the evolution of the domestic market. In essence, what they meant was the removal of barriers and constraints to market access and movement within the EU, resulting in an integrated and commercially viable economic market second to none in the world. The 15 nations that currently make up the EU truly represent an impressive economic market. With more than 370 million people (6 percent of the world population), the EU is the largest trading group in the world, accounting for one-fifth of global trade when counting movement of goods within the EU. The value of trade in the EU is equivalent to 18 percent of the 15- member nations' gross domestic product (GDP). In the service sector, the EU leads the United States in share of world trade, 24.9 percent to 20.1 percent (1998 dollars). The EU seemingly recognized early the opportunities presented by a global market and the ingredients needed for competitive success at the global level. Figure 1 is perhaps the most telling testament to the success of the EU in creating a vibrant economic market and the seeming impact of removing intra-EU transport barriers. As shown in this figure, the rate of growth in both goods and people movement has exceeded the growth rate in GDP, especially for goods movement. The growth rate in goods movement has averaged approximately 3 percent per year over the decade of the 1990s. Although the positive relationship between GDP growth and transport system usage is a phenomenon common to most countries, the marked increase in goods movement as shown in Figure 1 is remarkable. The significant increase in passenger and freight movement over the past 20 years has led to high levels of congestion on line-haul facilities and at transshipment points. Many motorways experience large delays, especially within and near urban centers. Ports, airports, and rail terminals are especially prone to peak congestion periods. This congestion is likely to get worse. Under current policies, freight transport in the EU is expected to grow 40 percent by 2010, with the highest growth expected for the road sector (50 percent). In some countries, the increase will probably be even greater. In Germany, for example, the German Ministry of Transport forecasts a growth in freight transport between 1997 and 2015 of 64 percent to 600 billion tonne-km. This congestion is most severe at strategic geographic barriers that hinder continental travel because of the "funneling" effect they have on traffic flow. For example, the Alps, Pyrenees, and English Channel were identified as critical locations in the European transport network where significant congestion occurs (see Figure 2 on next page). Providing additional capacity at these locations to handle this congestion will require substantial investment. In many cases, freight transport movements must share facilities with passenger movements, often to the detriment of freight transport productivity. Passenger rail service, which provides frequent service between most European cities, receives priority treatment on many rail lines. Because of the need to coordinate train movements, freight trains are limited in length so that they do not infringe upon the movement of passenger trains. Similarly, truck transport shares the right-of-way with passenger vehicles. It is not uncommon to see long queues of trucks on major motorways intermixed with passenger vehicles, waiting for congestion to clear. One of the interesting questions raised, but not answered, during this scan was the likely impact of the high-speed rail network being developed on its own right-of-way throughout Europe. Will this free additional capacity on the local rail network to provide for more productive freight rail service? High-speed rail has already affected air transport in common corridors. Air France, KLM, and Sabena (when operating) do not provide air service between Paris, Brussels, and Amsterdam because of the competition from the rail service. Historically, national transport systems were designed in part for national defense purposes, thus the physical design (e.g., rail track gauge) and operations strategies (e.g., ability to use locomotives across national boundaries) have often been incompatible. There are 37 different combinations of rail gauge/tunnel clearance/power systems in Europe. This legacy has left a significant challenge to modern Europe of providing a compatible transport network that is interoperable. Similarly, the historical development of individual national transport systems has resulted in a level of transport infrastructure development that varies substantially across the EU. Some of the newest members of the EU (e.g., Spain, Portugal, Greece, and Ireland) have significant needs for upgraded transport systems. Even some of the first member states have regions where adequate transport infrastructure is lacking (e.g., the southern part of Italy). The challenge of providing a minimum level of transport mobility across the EU is exacerbated when one considers the wide range of transport capability of the countries that are seeking membership in the EU, the so-called accession states. Transport policy is integrally linked to EU and national policies on environment/sustainability/energy. This is not surprising given that Europe has recognized for some time the important role that transport has in achieving economic growth, environmental quality, and community health. However, this linkage necessarily leads to different interpretations of what role transport will have in achieving the many different goals established by the European Parliament and/or national governments. For example, during the scan visit, there was considerable debate in the media and among transport officials on what level of reduction in vehicle-kilometers traveled was necessary to achieve sustainability goals. Transport officials, with a seeming closer connection to transport's role in economic development, were, in the minds of those more concerned about sustainability, not willing to target significant reductions. In many ways, this debate could provide the basis for Europe's ability to achieve what it has established as its desired sustainable future, while still remaining economically competitive. The changing global economy is also providing challenges to the EU. Globalization of production, procurement, and distribution; e-logistics and e-transport; and outsourcing of what traditionally had occurred internal to a company or country have caused many government and private sector officials to rethink what types of investment and at what levels are necessary to remain competitive. For example, the Netherlands is home to 57 percent of all European distribution centers for U.S. companies. Seventy-five percent of these centers are outsourced. This changing economy has especially affected logistics decisions, which has led to new organizations and strategies for reducing the logistics costs associated with freight movement within Europe and overseas (e.g., the freight division of Germany's national railway, DB Cargo AG, bought the Dutch rail freight subsidiary NS Cargo NV, and has formed new partnerships with BLS Cargo of Switzerland and the Danish Railway's DSB Goods to achieve economies of operation). The changing economy has been a large challenge for European freight shippers and operators because different business customs and practices have been, and still are, common in different parts of the EU. The key challenge for EU transport policy is shown in Figure 3. Whereas the EU and national governments are putting the greatest emphasis on shifting freight mode shares from road transport to rail and inland water, the historical patterns of usage have shown exactly the opposite trends. Freight rail mode share has declined significantly over the past 30 years; inland water mode share has declined as well, although not at the same rate. All of the government officials met with during the scan discussed the importance of rail and inland water freight services, combined (i.e., intermodal) freight services, and the use of road pricing to encourage a shift toward these services. The emphasis on intermodal freight services is especially interesting given the current low mode share for this type of service. Approximately 1 percent of all domestic freight movement in the EU as measured in tonne-km occurs by intermodal transport. Fourteen percent of international goods transport occurs by intermodal transport. Several of those interviewed also expressed concern that the quality and price of rail service, the operational difficulties in providing cross-border service, and the organizational culture of the rail companies themselves did not bode well for achieving this policy goal. In some sense, the "push" toward rail and inland water for freight movements is an "experiment" in the interaction of government policy, market response, and institutional capability. It will be worth watching to see what happens. In summary, Europe faces many of the same transportation problems found in North America. Economic growth has resulted in significant increases in both passenger and freight travel. In the transport sector, infrastructure development and operations have not kept pace with the tremendous increases in freight demand. The "common market" concept has certainly resulted in new challenges to the transport sector. The following sections describe how both the private sector and governments in Europe have responded to these challenges. In a market economy, public policies, and how they are implemented, can strongly influence the overall competitiveness of individual firms and of national economies. This is true not only with direct intervention strategies such as tax policy, but also with other policies that establish the market conditions within which goods are produced and consumed. Certainly, one of the most important factors in competitive production is the ability to transport people and goods in as safe and cheap a manner as possible. Given the level of economic growth in the EU described above, along with the concomitant challenges facing the transport system, what are the Europeans doing to provide a transport system that will support a truly integrated common market? Quadrante Europa/Verona Freight Village: The Verona (Italy) Freight Village is one of the largest consolidation centers in Europe, offering a wide variety of services to shippers, freight forwarders, and freight operators. Its location at the intersection of major motorways and rail lines in northern Italy makes it an ideal location for transshipment to northern Europe through the Brenner Pass. The Village handles more than 10 percent of Italy's intermodal traffic, 80 percent of which is international intermodal traffic. More than 4 million tonnes of freight by rail and 7 million tonnes of freight by truck passed through the Village in 1999. With over 2.5 million square meters of space, the Village offers many different services to customers, including intermodal transshipment capabilities among rail, road, and air transport; customs services (for non-EU shipments), warehousing facilities, forwarding and logistics support facilities, and general office space. 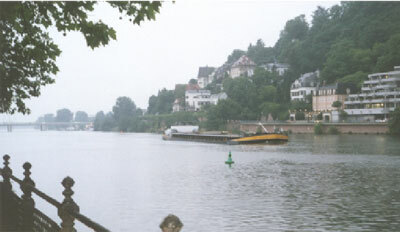 The intermodal traffic passing through the Village heading to Germany is facilitated greatly by the offered services. Kombiverkehr: Established in 1969, this German company is one of the world's largest providers of intermodal transport services. With encouragement from the German government, more than 250 European forwarders and transport companies became shareholders in the company. In essence, Kombiverkehr provides one-stop shopping for anyone desiring to transport goods via intermodal transport. Not only does it analyze the transport market to guarantee the lowest transport cost to its customers, but Kombiverkehr staff also organize and control the services of all suppliers. Intermodal services include block train service in Germany and in the EU, block train service to German ports, and rolling highway services throughout the EU. (A block train is an entire train dedicated to a particular service and destination versus a shuttle train, which has a fixed number of rail cars and runs on a given schedule.) Currently, Kombiverkehr uses 28 block trains per day to serve approximately 60 terminals/cities (plans call for 42 block trains per day). Rolling highway services, where the entire truck is put on a rail car and the driver stays in the cab, is only used if there is a governmental subsidy. Such a subsidy is provided by one of the German states (Saxony), which is providing a subsidy until a new motorway is finished (a rolling highway service in Switzerland is also subsidized by the Swiss government). Kombiverkehr also enters into partnerships with other organizations to further develop intermodal infrastructure. In particular, it has partnered in terminal projects in two German ports to expand intermodal handling capability. (In one port, the German government provided a substantial subsidy for capacity expansion that was frowned upon by the EU, which is concerned about port competitiveness among EU member states.) In 2000, Kombiverkehr provided services for the movement of 2 million TEUs (equivalent to 900,000 truckloads), 21 million net tonnes, and 14 billion tonne-km. Port of Gioia Tauro/Medcenter Container Terminal: The Port of Gioia Tauro, located on the southwestern coast of Italy, is one of the newest ports in the world. Interestingly, it has been developed primarily as a transshipment port for the distribution of containers to more than 50 ports in the Mediterranean, Adriatic Sea, and Black Sea. This type of transshipment represents more than 95 percent of the total freight movement in the port. When the original plan for a bulk cargo port was not realized, the Italian government and a consortium of freight carriers invested in the port as a new concept in Mediterranean freight distribution. The government provided approximately US$40 million for civil works construction, and the private consortium provided some US$250 million for supporting infrastructure (e.g., cranes). In 1995, the port served 50 vessels and handled 170,000 TEUs. In 2000, more than 3,000 vessels called at the port and 2.6 million TEUs were transshipped. The government and freight handlers are now investigating the possibility of marketing the port as an intermodal gateway to Europe. A trip from Southeast Asia to Rotterdam or Hamburg via sea would take 20 days or 22 days, respectively. Delivering the containers to Gioia Tauro and using intermodal services via northern Italy and Switzerland would take a total trip time of 14 days. There are currently two train departures per week to Milan from Gioia Tauro, with nine weekly departures from Milan to Rotterdam. The government, with EU financial support, is improving rail access to this region of Italy, thus making intermodal service even more viable in the future. In addition, the port is working with the Italian government and the EU to establish a free trade zone within the port boundaries. The EU is sponsoring a major training initiative at the port. 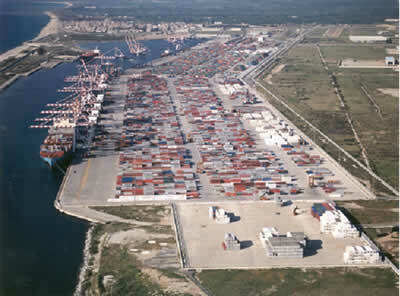 Port of Giaio Tauro, Italy: 1995-50 vessels/170,000 TEUs; 2001-3,000 vessels/2.6 million TEUs. Hupac/Trans Alp Service: The Alps serve as a natural barrier to the north-south movement of goods through Europe. Given that Switzerland is not a member of the EU, a coordinated approach to providing additional capacity at this critical location depends on negotiations among many different parties. For example, until 2000, Switzerland did not allow truck weights over 28 metric tonnes, while in Europe the weight limit was 40 metric tonnes. Accordingly, it was not surprising that two-thirds of the freight movement through Switzerland was by rail, whereas two-thirds of the freight movement through the French and Austrian Alps was handled by truck. Through negotiated agreement, the Swiss truck weight limit was made consistent with the European standard; however, the Swiss raised the road tax from US$90 per truck to US$200 per truck to compensate for additional road damage. Even with this increased cost, it was cheaper for German/Italian truck freight movement to go through Switzerland. This demand has often caused queues of up to 10 km at the Swiss border. In response to this market opportunity, the Hupac Group, a provider of intermodal transport, offers a variety of transport services. It owns 2,300 rail cars, locomotives, and its own terminals. With a US$300 per truck subsidy from the Swiss government, Hupac offers a rolling highway service that carries trucks and drivers across the Alps. This service represents approximately 60 percent of the volume carried by Hupac, with the other 40 percent being intermodal containers. Hupac currently offers shuttle trains between Italy and Germany/Belgium/the Netherlands. Given that Hupac can carry three times more freight with intermodal services than with rolling highway, and given that from an environmental perspective the rolling highway still relies on truck traffic at either end of the line-haul trip through the Alps, Hupac officials consider intermodal service to be the important market for the future. A new rail tunnel in the Alps, partially funded with the new road taxes, should provide more direct rail service from Milan to Frankfurt, especially with EU investment to upgrade rail lines on either side of Switzerland. Although Hupac officials foresee an important future for intermodal transport, they also expressed caution about some of the hurdles that remain. These hurdles include passenger and rail service sharing the same right-of-way, lack of interoperability among the national railways, the strength of labor unions in opposing new service arrangements, language and legal differences among EU countries, and the declining quality of service from the railroads (an internal study of Hupac's own service showed that 85 percent of the delay was caused on the rail portion of the trip). Flughafen/Cargo City, Frankfurt, Germany: Frankfurt Airport is the busiest cargo airport in Europe and the ninth busiest in the world. The management of the airport has been privatized, with 71 percent of the stock held by the national, state, and city governments and 29 percent held by private investors, including employees. Fraport, the name of this new management structure, has adopted a strong entrepreneurial approach to its business. It has aggressively pursued consulting opportunities in other countries, helping to finance, build, and operate airports elsewhere (e.g., Turkey). It provides management services for the Frankfurt Airport and is enhancing its already formidable cargo logistics capabilities. Fraport leases buildings and provides distribution and cargo handling services in Cargo City, a major transshipment site for freight that was established in 1996 on land once used by the U.S. Air Force (over 60 percent of the freight moving through Frankfurt is transshipped). Slightly more than 240 airlines, forwarding agents, and service providers are using Cargo City for a variety of services. Fraport works closely with prospective users of Cargo City, providing services ranging from preparing site plans to brokering investment in the proposed facility. In addition, Fraport markets its location as the world's first air/truck/train/ship port in the world with high-speed train service, direct links to Germany's autobahn, access to the inland port on the Rhine, and air links to more international destinations than any other European airport. In 1997, Fraport developed its own intermodal rail terminal and worked with Deutsche Bahn to provide rail service to the north. Called the "cargo sprinter," this service was a self-propelled consist that could handle five 40-foot containers. Two trains operated every day. During the first year, the service obtained 95 to 96 percent schedule reliability, and all the capacity was used. During the second year of operation, the railroad began reconstructing the rail lines and schedule reliability declined dramatically. Not surprisingly, freight forwarders dropped the service. Fraport hopes to reinstitute this service, but only if schedule reliability can be guaranteed. Port of Rotterdam/Delta Terminals/Rail Service Center: The Port of Rotterdam is the largest port in Europe, serving as the major gateway to the continent. More than 80 percent of all freight handled in the port is destined to outside the Netherlands. The evolution of the Europe Combined Terminals (ECT) complex at the port is an example of the strategies adopted by intermodal terminal operators to become more efficient and competitive. In particular, the Delta Terminal illustrates one of the most advanced terminal operations in the world. The transshipment operation is fully automated with robot vehicles moving containers to and from vessels. More than US$250 million was invested in the automation, aimed primarily at reducing labor costs. The terminal operates 7 days per week, 24 hours per day. ECT officials also have worked with clients and customs officials to expedite the customs clearance process. ECT container port in Rotterdam: Robot haulers unload container ship. Plans are being made to expand the capacity of the Delta terminals in anticipation of significant growth in container transport. However, ECT officials are concerned about the bottlenecks created by the limited land-side access. Concerted efforts to shift the access mode share away from road transport to rail and barge have been partially successful. In 1995, the respective mode shares of access modes were 53 percent for road, 14 percent for rail, and 33 percent for barge; in 2000, the mode shares were 44 percent for road, 15 percent for rail, and 41 percent for barge. The shift has clearly occurred in favor of barge. With the massive new investment in the Betuwe line (see inset page 14), however, ECT officials are hoping that rail can take even more market share from trucks. With more than 1 million ship movements annually serving the port, it is not surprising that congestion on the access routes to the port has been one of the most critical problems facing port and government officials. In response, the Dutch government has invested heavily in the development of a freight-only rail line connecting Rotterdam to Germany. Part of the strategy for improved rail access to the port was the creation of dedicated rail service centers for the port. 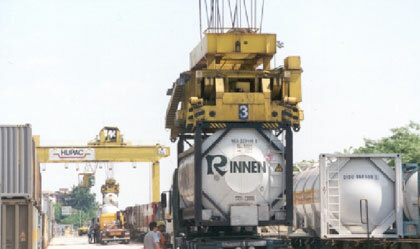 In the mid-1990s, approximately 50 different terminals and depots provided rail access throughout the port. A private company approached the Dutch government with a plan to rationalize this rail service. This plan was based not only on the governmental policy of shifting access market share away from road transport, but also on the realization that the market itself was changing. Container transport already held a significant market share, and was likely to increase. Carriers were expected to concentrate on a limited number of ports, where port attractiveness depended on such things as accessibility for vessels, reliable inland connections, cargo handling capability, and customer service. The proposed plan closed the 50 terminals and replaced them with two rail service centers at either end of the port. A rail shuttle service between these two service centers was established with 100-TEU capacity per shuttle. Daily shuttle train service was also instituted between the rail service centers and 37 different destinations in Europe. The Dutch government built the track for this shuttle as well as the two rail service centers. The private company pays rent and owns the rolling stock for the shuttle operations. The Betuwe Route corridor connects the port of Rotterdam to Germany, 160 km to the east. As the busiest port in Europe, Rotterdam is continually concerned with access to the port terminals, and particularly in the context of EU and Dutch national policy, of promoting non-truck access. The Betuwe Route project is an approximate US$4 billion project that will provide electrified freight-only twin rail tracks connecting to the German national railway system. The Dutch national government, private investors, and the EU are contributing dollars this project, which is expected to be completed in 2005. Considerable attention has been paid to community impacts of the proposed route, with mitigation including passing the tracks through tunnels, sunken sections, the roofing of the most sensitive sections of the track, and added insulation in 400 homes. There will be no at-grade crossings, approximately 95 km of the rail line will be parallel to a major motorway, and a freight shuttle service will provide easy transfer of waterborne containers to rail or road. The Betuwe project is one of the priority transport projects of the EU. The new rail service concept has been successful in increasing rail's market share, although not yet to significant levels. The opening of the Betuwe line is anticipated to increase the attractiveness of rail access to the port. Such attractiveness will be necessary to achieve the government's goal of rail achieving a 20 percent market share in mode of access by 2010. The government has adopted a national transportation goal of reducing the amount of freight moved by truck. A program called Transactie Modal Shift provides government funds shippers to conduct logistics scans and to develop long- plans for more efficient goods movement. Proposed actions have included the development of new logistics strategies (e.g., reduction in scheduled deliveries and improved route planning), changes in transport technology (e.g., use of sea containers), consolidation of freight distribution activities at freight centers, and enhanced training to improve vehicle fuel efficiency From 1997 to 2000, 200 logistics efficiency scans, 100 mode shift scans, and 50 integrated scans were conducted, resulting in 142 implemented projects. Seventy-five of the mode shift scans showed the possibility of using intermodal services, and in approximately 10 percent of these cases, such service was cheaper than existing truck service. The largest mode shift was from truck to inland water transport. The government estimates that the implemented projects resulted in a reduction of 72 million vehicle-km because of more efficient logistics strategies and of 18 million vehicle-km because of targeted mode shift strategies. The previous case studies have focused on the provision of freight infrastructure or the development of new freight services. The scan team also found that new institutional arrangements are being developed between shippers and infrastructure providers. For example, a new company called Rail4Chem has been formed by a German forwarding company, a Swiss freight forwarder, and one of the world's leading chemical producers to run its own trains dedicated to chemical transport. Similarly, a joint track access agreement among Swedish, German, and Danish rail infrastructure operators and IKEA Rail AB, the rail freight subsidiary of Swedish furniture producer IKEA, has resulted in IKEA running its own trains in these three countries. As can be seen in the above examples, intermodal freight has been an important strategy for the facility operators, logistics company, and service providers visited during this scan. To make intermodal freight transport successful, however, a large number of challenges must still be overcome. These challenges range from the ability to handle large numbers of containers on terminal access routes (i.e., Rotterdam) to the ability of the railroads to provide scheduled service that is reliable (as noted by Hupac and Frankfort Airport officials). Those making the shipping decisions, the freight forwarders, will choose the services that are most reliable and cost the least. Thus, given the emphasis and expectations placed on the role of intermodal transport by government officials, it remains to be seen if the necessary service structure and infrastructure will be in place to provide the reliability in service that is necessary to achieve the desired level of market share. Governments can influence economic market conditions in a variety of ways, through direct intervention in market pricing or through the provision of infrastructure and services. Just as in North America, the economic and transport challenges facing Europe require the coordinated efforts of many different levels of government. Many innovative and creative solutions to the problems encountered in improving mobility and accessibility often surface from such collaboration. The following sections describe what the scan team found at three levels of government planning and management as they relate to the freight transport challenges described earlier. Establishing a common policy framework: The Treaty of Rome, the agreement establishing the structure of what is today the EU, recognized the important role that transport policy could play in developing a European common market. The Treaty called for the development of a common transport policy that would provide a framework within which member countries could develop their own transport networks, while at the same time improving the performance characteristics of the European transport system as a whole. By providing compatible system improvements whose benefits transcended any individual country, the EU was targeting strategic investments whose net impact would be of benefit to the entire EU. Given that national transport networks serve as the foundation for the prospective European network, it is not surprising that one of the initial challenges facing the EU in the transport sector was establishing the interoperability of services and infrastructure for trans-European travel. Neil Kinnock, European Commissioner for Transport from 1995 to 1999, summarized the key characteristics of the Common Transport Policy in a 1999 progress report on its achievements [European Commission, 1999]. The following statements from this report provide a good sense of the key characteristics of this policy (emphases added). "Sustainable mobility is the core purpose of the Common Transport Policy. The Commission has been developing policy approaches that will encourage the establishment of public/private investment and development partnerships. The Community has an obligation to pursue measures to improve transport safety. (The) rail, road, maritime and aviation systems... must also be made interoperable. (It) is essential to make much better use of what exists. Intermodality... could transform the ease and efficiency of movement. To protect the legitimate interest of consumers and competitors in transport as elsewhere, the competition rules that help to sustain the vitality of the market system have to be applied." The principles articulated in the Common Transport Policy have guided EU policy making and rule promulgation over the past decade. As such, it has provided a common point of departure for member nations in developing their own national transport policies and for establishing the transport-related criteria that must be satisfied for new members to join the EU. One of the key principles now being considered seriously is the implementation of road pricing. However, the exact nature of how this concept is to be applied is not yet determined and is subject to a great deal of debate. high target value for reduced road use. Those more concerned with the relationship between the transport system and economic development/trade wanted to help achieve sustainability/energy conservation goals, but with transport having a smaller target in road-use reduction. Advocating common principles and interests that can be reflected in national policies: Within the context of adopted policies and frameworks, the EU is a strong advocate for the coordinated development of national transport policies that are consistent with each other and with EU positions. In some cases, the EU acts as a catalyst in coordinating multicountry planning, policy development, and research activities. It was noteworthy that some of the principles put forth by the EU were repeated in presentations by national ministry of transport officials, private service providers, and facility operators. Thus, there seems to be some success in providing a channel for the consistent articulation of common goals and strategies at the different levels of governance and corporate decision making that affect the transport market. The greatest evidence of this consistency was the policy approach adopted by the EU in its transport policy that was reflected in the Dutch national policy as well. The approach simply is to establish target market shares for the different modal systems. For example, the chart below shows the growth rates for mode share in the Netherlands that have been established for the year 2010, compared with the likely scenario if the transport policy is not followed. As shown, road transport will grow by 50 percent without the actions proposed in the transport policy or will grow by 38 percent if such actions are implemented. Rail, inland water, and short sea transport will grow at faster rates under the new policy scenario. These target values are very ambitious and in many ways represent dramatic changes in the way freight moves in Europe. Many of those interviewed questioned whether the rail industry can come anywhere close to the targeted market share desired in the policy given historical and industry-specific barriers. Targeting strategic investments to significantly improve transport system performance: The Maastricht Treaty in 1992 extended the Treaty of Rome's benchmark position on the EU common transport policy by fostering the development of trans-European networks in several infrastructure areas, including transport. Trans-European transport (TEN-T) networks were defined for high-speed trains, highways, combined truck/rail transport, and inland waterways. The scope of the TEN-T program encompasses hundreds of projects throughout the EU, ranging from large-scale infrastructure development to the application of ITS technologies on existing infrastructure. The European Commission recommends corridor projects, and the European Parliament and Council choose which projects should be included on the basis of staff input and political considerations. To provide some political support to the program, the EU identified 14 concepts/projects that were to receive highest priority. Figure 4 shows these 14 priority investments; the criteria for selecting these priority projects are shown in the sidebar on page 19. Betuwe Line, conventional rail/combined transp. The EU provides funds to leverage project funding from other sources. For example, the EU will provide up to 50 percent for feasibility studies and up to 10 percent for construction (85 percent for accession countries, which at this time include Ireland, Greece, Portugal, and Spain). EUR 18 billion is available between 2001 and 2006 to trigger an expected EUR 60 to 100 billion in investment from other sources.1 Historically, however, from 1996 to 1997 a total of EUR 38 billion was spent on TEN-T projects, with the EU representing a 30 percent share. The buy-in from member governments and the private sector on the priority projects has been more modest than expected, partly because of a slowdown in the economy, an overestimation of private sector financial interest in the projects, and in some cases, encountering environmental problems with a project. A proposal is expected to increase EU participation to 20 percent for projects relating to the implementation of ITS technologies. This plan reflects the importance that EU officials are placing on the role of technology-based system management. As stated by one official, "To compete, we must be high tech." The EU also has encouraged a regional systems management approach that will provide integrated traffic control over large portions of Europe's transport network. Studies contributing to improved design and better implementation of the TEN-T network. The EU has recently adopted a multiyear programming approach to project prioritization. A maximum of 75 percent of the budget will be allocated in the following way: 45 percent (of the 75 percent) will go to projects with public/private sector participation, 20 percent to the implementation of a continent-wide global positioning system (GPS), and 35 percent to other transport projects, such as air traffic control, ITS, rail bottlenecks, etc. A small amount will be set aside to provide risk capital for projects that are outside this program but that have high potential for substantial benefits. It is of interest to note that most of the TEN-T priority projects completed so far are contained within one nation's borders. The multinational projects, which presumably require more coordination and negotiation, have not been implemented as quickly. Identification of best practices among member states. Collection, analysis, and exploitation of data to combat fraud. Support for customs administrations to improve internal administrative structures (e.g., risk analysis, post-importation audits, and computerization). Exchange of customs officials among member states. Training that disseminates best practices. Computerization of customs procedures throughout the EU. There was no indication from those interviewed whether this was a conscious decision on the part of the EU (i.e., pushing projects first that were "easiest" to show progress toward program goals) or whether this was the natural result of the complexity of multijurisdictional implementation. In addition to investment in infrastructure, the EU targets human resource development and training as part of its overall strategy of economic and social cohesion. In 2000, for example, more than EUR 480 million was allocated for education and vocational training. The scan team found examples of EU training investment at some of the sites visited. Establishing legally binding rules and regulations: In the majority of policy areas, the responsibility for implementing EU policies and guidelines rests with the member states. Thus, in some ways, the level of effectiveness of EU policy guidance depends on the willingness of member states to adopt the recommendations. In other cases, binding rules and regulations are used to guarantee universal implementation of a policy, which is monitored by the EU. Examples of legally binding rules include allowable vehicle weights, vehicle emission standards, aircraft noise standards, and allowable trucker driving hours. If warranted, the European Commission can take a member state to the European Court for legal resolution. An example of the role of the European Court was a case initiated by the Dutch that challenged favorable pricing of German rail services to the ports of Hamburg and Bremen. The resulting agreement establishes maximum flow rates that can cross three border locations. A more recent policy that has an important effect on the European freight network is a policy of disassociating the management/ownership of rail infrastructure with those responsible for operating freight services. The European Commission also monitors member nation aid to its own transport industry to maintain market competition. Perhaps the greatest success in establishing consistent application of EU rules was the reduction in customs clearances at national borders. Prior to 1993, all truckers were stopped at each national border for customs checks, tax clearance, and, in some cases, vehicle inspection. On January 1, 1993, all such national border checks were abolished, although spot checks still occur for drugs and immigration enforcement. The creation of free cross-border transport was identified by almost all those interviewed as one of the most important EU actions for creating a better market environment for freight transport. The transport acquis must be incorporated into the national legal system of the candidate country. The implementation of the transport acquis must occur by providing administrative capacity, institutions, and budgets necessary to carry out this legal basis. The enforcement of the transport acquis should provide the necessary controls and penalties to ensure that the law is being complied with. The EU also provides financial assistance to candidate accession countries. A large percentage of the assistance is assigned to helping candidate countries bring their infrastructure up to EU standards. In 2000, EUR 3.2 billion was earmarked for helping the candidate countries. More than EUR 1 billion was provided to upgrade transportation and environmental systems to EU standards. A program called Phare provided EUR 1.5 billion to modernize and adapt the economies of the accession countries. The EU budget provides EUR 22 billion for pre-accession support from 2000 to 2006, and EUR 57 billion for new member states from 2002 on. Examples of the types of studies undertaken by the Phare program include the investigation of the competitiveness of the rail system in eastern and central Europe, the application of road transport charges, costs of upgrading each accession country's transport infrastructure, forecasting traffic demand for 10 Pan-European transport corridors, road and maritime safety, and the extent to which environmental concerns were being addressed within the accession countries. Importantly, 30 percent of the Phare budget was allocated to human resource development. Between 1996 and 1999, more than 1,600 individuals in the accession countries received training. Much of the effort at the EU for the past several decades has been on institution building, that is, providing the institutional structure that can act as the foundation for the EU concept of "one Europe." The EU has clearly been advantageous for the European transport sector. Not only has it fostered the removal of barriers to cross-border travel (e.g., customs at national borders), but it has also raised transport policy issues to the international and national levels of debate. Transport policy is in the middle of key debates on the economic and environmental future for the EU. An important issue for the EU is enlargement (i.e., whether to admit membership to one or more of 13 aspirant countries). Integration of the transport acquis into the national legal and administrative framework. Provision of administrative capacity, institutions, and budgets crucial to implement the transport acquis. Freight transport is featured throughout the 31 conditions of the acquis as parts of the following sections: free movement of goods, transport policy, energy policy, customs, freedom of movement of persons (labor), free movement of capital, freedom to provide services, corporate law, competition policy, etc. Matters such as transport equipment standards and registrations, safety standards and workplace conditions, operator qualifications, transport networks and open access to same, interoperability, structure of user taxes and fees, etc., are all components of the transport sector. An overview of the enlargement process is contained in European Union Enlargement: A Historic Opportunity, which is available from the European Commission's Directorate General of Enlargement. A Guide to the Transport Acquis is an informal document compiled by the DGTREN (formerly DG-VII), the EU's Directorate General for Transport & Energy. It summarizes current EU transport legislation as a resource for the public authorities of candidate countries to use in preparing their position papers in support of their application for accession. At the same time, several pre-membership funding programs are available through the Directorate General for External Relations for use in support planning and analysis. In the transport sector, a wide-ranging study resulted in the October 1999 report, Transport Infrastructure Needs Assessment (for 11 of the 13 prospective member states), including a first definition of infrastructure components to extend the TEN-T (Trans-European Transport Network) into the candidate countries. Many smaller area studies have been funded, including, for example, Analysis of Rail Competitiveness in Central and Eastern Europe, Need for a Common Pool of Combined Transport Equipment, Danube Corridor Development Plan, etc. In some of these studies the scope has been extended to Albania, Bosnia-Herzegovina, and the former Yugoslavian Republic of Macedonia. Inland shipping: An important means of freight distribution in Europe. The future role of EU governance is at the core of policy debates and will likely remain so in the foreseeable future. The role of a central authority in the form of the EU versus that of member states is the crux of the issue. In the transport sector, for example, member states still wield an important influence on the overall effectiveness of EU policy outcomes through their policy implementation responsibility. Consistent application of transport policies at the EU level requires the agreement of member states. The adoption of policies that are controversial, or that impact one group more than others (e.g., road pricing), can be delayed while the politics of acceptance are worked out. One of the ways of providing political acceptance of such policies is to structure their implementation so as to achieve the ultimate objective (e.g., shift in mode share), but still "hold harmless" the industry or sectors that have to respond. For example, current road pricing proposals suggest that increased road prices that will influence market transport decisions will be offset by reductions in tax burdens to the road transport industry so that the net financial effect on this industry is close to zero. The Common Transport Policy provides an important point of departure for the development of transport policies in member nations. Road pricing, for example, which is very much supported by the EU, is finding its way into other transport policies (e.g., that of the Netherlands). The approach of targeting market shares by mode, however, raises significant questions concerning the ability of these modes to achieve the desired levels. In the European case, this seems especially true for the rail industry. The quality of service provided and continuing interoperability issues need to be addressed before such targets can be reached. The EU provision of funding for strategic transportation investments is an important component of the strategy of providing a consistent and coordinated transport infrastructure within the EU. Several of those persons interviewed noted, however, that the assumption of private sector interest in paying for a share of this investment cost was too optimistic. Government investment in the projects was needed to reduce the risk for private investors. Those interviewed stated that it also was important to have a specific project authority that has responsibility for project implementation and is held accountable for program success. Since the panel's visit, the EU has published a revised transport policy: European Transport Policy for 2010 - Time to Decide. The new policy concentrates on effecting a shift of modal transport away from roads to more sustainable modes, while alleviating the high level of traffic congestion on European roadways. The scan team visited a small number of countries, thus generalizations that apply to all member countries of the EU are inappropriate. Some important observations can be made, however, on how these countries have responded to the EU's transport policies as well as on their own policies/programs for improving freight transport. In addition, these countries have a long history of participation in trade and in the movement of goods and services, thus this experience is potentially valuable to the North American context. Linkage to broader societal goals: The transport policy challenge to the EU countries, and to the EU itself, is balancing the many different goals that have been identified by policy makers and by the public as being important for the future of the community. In particular, sustainability has been identified as one of the overarching goals that should guide investment policies. In some sense, one of the differences between the national transport policy emphasis on intermodal transport in Europe and of that in North America is the linkage to these broader goals. Sustainability, energy conservation, and quality of life are driving forces for public policy interest in intermodal transport in Europe. Economic efficiency and productivity tend to be the major motivation in North America. Consistency with EU policies: Even with the limited number of countries visited, there seems to be strong consistency between national government transport policy and EU policy. The latest transport plan for the Netherlands, for example, highlights those areas where the Dutch policies are consistent with EU policies, in particular, in the areas of road pricing; deregulation of the road transport market; liberalization of the railways; safety, accessibility, and emission requirements for vehicles and vessels; and electronic vehicle tagging.3 In Italy, Germany, and Switzerland (even though the latter is not a member of the EU), the scan team identified policy approaches that were supportive of the overarching EU common transport policy framework. The Netherlands has amended the national environmental law to streamline the environmental review process for projects that are of national significance, in particular, the Betuwe freight rail line and a high-speed passenger rail line. Projects of national significance must still go through the environmental review process, but by reducing the number of required project justification documents, the initial phases of this process are shortened. Once the decision has been made after the environmental process to proceed with a project design and the corresponding environmental mitigation, local communities are asked to sign an agreement to this decision. Once these agreements are signed, the implementation of the project cannot be legally challenged. Focus on transport system infrastructure and technology: The member states recognize the importance of efficient transportation systems for their economies and for the success of the EU. There was a general understanding on the part of all government officials interviewed of the "bigger picture" of continent-wide transportation services and where their country's transport network or facility's operations fit into this bigger picture. In fact, the Dutch have invested in the transport system beyond their own borders. The Netherlands has invested in a high-speed rail project in Belgium, and there was some speculation that investment might occur in Germany to improve rail service, both of which would benefit the Dutch economy and the efficiency of its transport system. The Port of Rotterdam has invested in facilities in Hungary and the Czech Republic that make the port more competitive in those markets. In EU countries, large investment has occurred and is continuing to occur that is aimed at improving the physical transport infrastructure. In addition, the application of advanced ITS technologies for system management, in conjunction with corresponding investments by the transport industry for its own operations, is considered to be one of the more important future directions in system investment. Investment in freight infrastructure: The countries visited seem to provide greater levels of public investment in freight infrastructure than are found in North America. In many cases, the government's focus was on providing the infrastructure (in some cases leasing it to a concessionaire) and, where appropriate, providing loans to those operating services and terminals. The conditions for the latter support were most often that full access to these services had to be allowed, and that the public subsidy did not diminish the competitiveness of the freight industry in the local market. The most impressive example of such an investment is the Betuwe rail corridor in the Netherlands, which represents a US$4 billion commitment by the national government to rail freight. This level of investment was not the norm in the countries visited. Clearly, the Dutch government has a greater sensitivity of, and willingness to invest heavily in, freight infrastructure given its country's location at the heart of Europe's economy (see Figure 5). Intermodal transport: An important part of the EU strategy for freight mobility. Figure 5. The Economic Heart of Europe. Emphasis on using existing infrastructure as much as possible, and thus a governmental interest in intermodal transportation: One of the key targets for providing enhanced freight transport mobility is to use the existing multimodal transport infrastructure more effectively. In the Netherlands, for example, ministry officials stated that most improvements to transport system performance will come first from operational enhancements, second from pricing, and finally from capacity expansion. Freight transport policy has emphasized shifting market shares to modes of transport that are currently underutilized, primarily inland water, short sea, and rail transport in order to maximize the number of alternatives available to system users. In this context, many government officials view intermodal freight transport - rail/truck, rail/barge, and truck/barge - as an important means for achieving modal shifts. This is the case even though current market share for intermodal freight transportation and rail freight transportation is very small. Some governments are providing monetary incentives to encourage this shift. Germany, for example, provides the following inducements for those using intermodal transport: reduced road vehicle taxes (currently EUR 2,500 - 3,500 per general freight truck; zero for intermodal carriage), allowance of greater vehicle weight (44 tonnes instead of 40 tonnes), exemption from road driving bans on holidays and weekends, and exemption from cabotage rules. The emphasis on intermodal transport has also led to interest in promoting better transshipment capabilities at terminals and ports. For example, an EU Green Paper on Sea Ports and Maritime Infrastructure argued that ports needed to be included in the TEN-T program because of the importance of interconnection and interoperability of national networks (EU ports handle approximately 30 percent of intra-EU freight movement).4 The "rationalization" of Europe's ports from the perspective of which ports should serve as the primary gateways to the EU could potentially be a significant challenge (and controversy) given the large number of ports that exist in EU countries. The competitive nature among European ports leads one to suspect that efforts to rationalize port gateways from an EU perspective is going to be very difficult. Development of a market-driven transport policy within the context of public interest: Both EU officials and national officials stated that the focus of freight transport policy is on influencing the transport market through pricing and financial incentives that influence the decisions of freight forwarders as well as operators. To some of those interviewed, this is a different approach than what has been tried previously, which was described as a "Thou shalt..." approach. That is, government policies mandated that certain market responses would occur, but would not put in place incentives or disincentives to obtain this result. Perhaps the best example of this market-driven transport policy is found in the German and Dutch governmental subsidy programs for intermodal terminal developments and the logistics support program in the Netherlands where the basis for the program is letting private firms decide what is feasible, and then providing leverage capital to make the investment decision economically viable. Dutch officials described this approach as using public policy to augment logistical efficiencies. Road pricing is one of the cornerstones of the market-driven transport policy. The EU has adopted road pricing as an important lever for influencing mode choice. Member countries have mirrored this focus. In the Benelux (Belgium, the Netherlands, and Luxembourg) countries, for example, current passenger pricing schemes rely on toll roads or lanes. The governments have proposed to implement a peak hour fee scheme in 2003, and a per kilometer charge by 2010. Public opposition to the peak hour fee has resulted in a change in strategy to implement a per kilometer usage fee by 2006. Similar pricing schemes will be applied to use of freight road, rail, and inland water infrastructure. To retain competitiveness of their transport industry, the governments have proposed to offset these increased costs by reducing tax burdens in other parts of the transport business. The road pricing schemes remain controversial, so they still might not be implemented by the proposed schedule. The Betuwe rail freight corridor in the Netherlands connecting the port at Rotterdam with Germany is an example of how difficult it can be to create public/private partnerships (see inset, page 14). Initially, the Dutch government planned to have substantial private investment in the provision of the rail infrastructure, but later determined that such a commitment was not likely to occur. There is some thought at this time of selling the rail infrastructure to a private concern after 10 years. Part of the operations of the rail line included the construction of rail service centers that were built with government funds but are being managed by a private firm. Another example of public/private cooperation was the port's investment in a railroad bridge as part of a strategy to increase rail access to the port. Both the Netherlands and Germany have provided subsidies to inland freight terminals where access is provided to all customers. In the Netherlands, 50 percent of the investment must be from private sources, 25 percent from the national government, and 25 percent from the provincial/local governments. See inset below for a description of the German intermodal terminal subsidy program. In Italy, the new transshipment port of Gioia Tauro received national government investment in the port facilities themselves as well as in road and rail access improvements. Private companies have provided much of the investment for the port operations facilities. In Germany, the national government has participated in the privatization of the Frankfurt Airport and provided the impetus (and subsidies) for freight forwarders to create a third-party intermodal logistics company. The terminal improvement must not be economically viable solely with private financing. The terminal operator must be different than the organization that owns the terminal. Open access to the terminal improvements will be allowed to all who desire to use the operation. An intermodal facility or facility expansion is planned in the region by one of the intermodal carriers. The funding recipient must commit to operating the facility for a specified period of time, which varies according to how much of the initial cost is borne by the recipient. At least 20 percent of the government funding will come in the form of an interest-free loan, with the rest being a construction grant. Eligible activities include loading and siding tracks, road connections, loading equipment, support buildings, signalization, and automated vehicle identification (AVI) systems. Planning costs up to 10 percent of the eligible construction costs also are also allowed. For the years 2000 and 2001, the government has spent DM 230 million on 10 such projects, out of a total national transport budget of DM 17-18 billion. In 1991, the European Commission issued a non-discrimination directive that stated the owner of infrastructure could not be the operator of services using that infrastructure. Government construction of rail lines or terminals will thus require partnerships with private firms to operate or manage these facilities. National planning and analysis for freight investment reflective of importance attached to the role of trade and the transport industry to the nation's economy: The scan team visited only one national ministry of transport, in the Netherlands. It is clear from this visit that, at least in the Netherlands, freight transport is a concern at the national level and is approached in a very systematic and analytical fashion. Performance measures and economic indicators that are collected as part of a European transport information system are used to monitor system performance over time. The analysis of freight transport futures was based on scenarios that made different assumptions concerning the stability of European progress toward closer cohesion. For example, the scenarios included a status quo (termed divided Europe), a coordinated Europe, and a Europe integrated for global competition. The results of this analysis as presented in the national transport plan are shown in Figure 6. It also was interesting to note that the ministry itself is organized into four directorates general, one of which is dedicated to freight transport. Figure 6. Scenario Analysis in National Transportation Planning in The Netherlands. According to those officials familiar with the national transport planning activities of other EU countries, this attention to freight issues is similarly found in other ministries (although the Netherlands is considered to be a leader in such planning). Similar to experience in North America, local governments at the sites visited have played an important role in fostering those activities that result in economic development for their city or state. These roles range from expediting permits and planning procedures to providing financial support for infrastructure development. For the facilities visited, local governments had reconciled the linkage between investment in economic development as manifested in freight distribution terminals/ centers and community goals. It also is important to note (to establish the correct context for our findings) that, in some cases, local and private investment took advantage of opportunities not available to other locations. In some sense, these opportunities were "accidents of history." For example, the freight distribution center at Frankfort Airport, which is strategically located within Europe and has tremendous opportunities for expansion, is located on land used by the U.S. Air Force during the Berlin Air Lift. Much of the infrastructure investment at the new transshipment port at Gioia Tauro was originally built as a bulk commodity port that was never finished. Rotterdam's preeminent position as a port gateway to Europe results from its strategic geographical location. Port of Rotterdam: The port is municipally owned and operated. As noted by a port official, the port is run like a business, but with a public purpose. In the business plan for the port, this public purpose is clearly defined as remaining the strong foundation for the city's economy (and, indeed, the country's - 20 percent of the Netherlands' GDP is attributed to the Port of Rotterdam and Schipol Airport). Port officials are strongly supportive of investments that will maintain Rotterdam as the leading port of Europe. For example, the port built a railroad bridge because it realized the bottleneck that port access represents to future port activities. Other port investments are similarly aimed at enhancing the competitive advantage of Rotterdam over other ports. Port of Gioia Tauro: The port is a major employer in southwestern Italy. Because of its strong economic impact, the state and local governments have been very supportive in helping the port develop its plans for expansion and in providing support for access improvements. Some of the funds provided to the state of Reggio Calabria for economic development purposes have been used to improve the position of the port. Verona Freight Village: The board of directors for the Freight Village consists of three representatives from the chamber of commerce, three from the City of Verona, and three from the province. Local officials view the Village as one of the main foundations for the economic success of the Verona region, and they have devoted considerable energy to supporting its viability. This support includes providing financial support for needed infrastructure as well as expediting planned expansions through the planning approval process. Frankfurt Airport: The City of Frankfurt is part owner of the management company that is operating the airport. As such, it provides policy guidance on what is desired from the community's point of view. City officials also have participated closely with the airport in developing plans for expansion of Cargo City and other economic development opportunities at this site. One of the most important concerns of freight transport users, and thus of transport officials identifying improvements to this system, is the reliability of service or trip-making. Speed of travel is important, but the results of service strategies examined as part of this scan suggest that system reliability is even more important. This need has significant implications on the types of performance measures used in system monitoring and in the criteria used for project prioritization. The EU illustrates the importance of having an international and national policy on investment in freight transportation. Public and private investment in freight facilities has occurred, and continues to occur, in Europe. Public investment is designed to act as a catalyst for private investment in services and facilities that could provide important public benefits. In some cases, such investment is being considered from a true "systems" perspective (i.e., improvements are being made in infrastructure that is outside of a nation's boundaries, but that will clearly benefit that nation's economy). Public investment targeted at freight movement should adopt a framework in which private firms are provided incentives to choose what is best for their business within a context of achieving public goals (e.g., economic development, sustainability, etc.). This was portrayed by the Europeans as making market-driven policy decisions within a "public good" context. Interestingly, a long-term public policy focus in this context was around 10 years, whereas the private sector focus was at most 5 years. The focus of the overall policy was to make the best use of existing transportation options (e.g., rail and inland water transportation) before developing new transport networks. As one Dutch official stated, transportation system management strategies come first, followed by pricing strategies, and finally by actions to construct new infrastructure. Public budget and financing mechanisms for funding freight projects exist in the EU, although as a percentage of total transport system investment, they are quite limited. No debt financing was found in any of the examples discussed, and for the very largest projects (e.g., the Betuwe corridor) little private investment occurred up front. However, even with this, the level of public investment in freight facilities and services, and public policy attention to freight policy, seems far greater in Europe than in North America (even with projects like the Alameda Corridor in the United States). A critical role for multinational efforts is to foster open competition and open borders. Free access allows the market to take advantage of productivity economies and results in market-reflective decisions. The European experience suggests that there might have to be different market incentives and rules for different segments of the transportation system (e.g., intermodal terminals, national rail service, inland water, etc.). The EU has served as an important forum for establishing consensus on strategies for establishing an openly competitive market in Europe. Such a forum provides the institutional framework for developing a common message among government agencies and among important stakeholders as it relates to economic competitiveness. In addition, such a forum has raised transportation issues to the level of national political debate. Interoperability and consistency in national laws and regulations are important areas for multinational concern. This leads to a concern for consistent application of information technology strategies across borders. Although important, these issues should not overshadow much broader concerns for market-driven policy and decision making. In addition, the EU experience suggests that issues such as language compatibility, signage consistency, and handling of paperwork precede information technology concerns. In the case of European freight movement, the trucking industry seems to have dealt with these problems more successfully than the rail industry. The EU has incorporated human resource development/training as an important component of any public/private initiative aimed at improving freight movements. This training has been done primarily to raise the quality of life of the communities that are affected by freight facilities and operations. Collaboration with research centers in Europe (e.g., the Intermodal Transport Research Center in Hamburg) to monitor the response of intermodal freight to national and EU policies. Comparison of North American and EU productivity in freight transportation and the differing criteria for investment. Review of existing forums/mechanisms for NAFTA discussions to see if there are more effective means of trilateral cooperation in regard to transportation decisions. For example, how should improved water transportation opportunities be incorporated into ongoing discussions? Are there different models for institutional decisions in North America? How do we get trade/commerce groups involved in these discussions? Continued monitoring of EU experience with road pricing and success in mode shifts. Examination of adopting a systems perspective on freight transportation, including not only a conceptual model, but also one that reflects performance measurement. Examination of global freight flows and the relative importance of different transport flows to global trade movement. The terrorist attacks against the United States on September 11, 2001, highlight another critical aspect of how international border crossings must be viewed. The focus of this scan was on international freight movement and on easing the transport constraints of an open market. National security and the consequences of groups or individuals taking advantage of open borders to bring harm to targets within a country have always been of great concern to security agencies. The events of September 11th will only magnify these concerns. Although the scan did not investigate the European strategies for border security, the scan team believes the topic of maintaining national security in the context of a NAFTA market is worthy of further study. The primary intent of these questions was to understand the history of, and current situation with, the influence of EU policies and actions on freight movement in Europe. This set of questions focused on the institutional structure and policy framework for EU decisions (and responses from the market). Please discuss how EU freight policies are formulated and implemented. What are the current EU freight policies as they relate to freight movement within the EU? As they relate to trade with non-EU nations in Europe? As they relate to trade with North America? What were the major freight-related challenges faced by the EU during its creation (e.g., institutional relationships, regulatory consistency, financial needs, environmental policies, operational strategies, etc.)? Has the existence of the EU changed policies or operating considerations for freight movement among member nations? If so, how? What has been the effect of EU policies (e.g., the removal of trade barriers and tariffs) on the amount and type of freight shipped and on the method of shipment? customs clearances at national borders? What differences still remain and how will they be dealt with? How are these issues dealt with for non-EU-member border crossings? What problems has an open borders policy created for freight logistics and for infrastructure providers? With hindsight, what should have been done differently to more effectively consider freight movement within the context of the EU? What issues do you see challenging freight movement within the EU? Where do you see common points of interest between the EU and NAFTA nations? Are new or stronger transatlantic relationships needed to deal with future freight needs? Are freight facilitation issues faced by the EU the same or different than issues addressed individually by members prior to the development of the EU? To what extent does the EU focus on regional (within Europe) transport issues as compared with the EU as a whole? To what extent do national boundaries serve to define economic submarkets? Or has the concept of an economic market now transcended national boundaries? Are there economic, safety, vehicle size/weight, driver utilization regulations that govern EU freight movements (outside the context of border crossings)? If so, how are these regulations developed and applied? How do these regulations and taxation policies affect pricing? To what extent have the various modal providers of transportation services cooperated in developing common technology standards? What has been the role of the EU or individual national governments in fostering such cooperation? Is there any EU policy aimed at diverting freight movement from one mode to another (e.g., from highway to rail or water)? If so, how does the EU or member nations participate in developing and implementing such policies? The purpose of these questions was to understand the role of the EU in the planning and financing of transportation infrastructure. The focus was to be on process, data, analysis, and respective roles of the public and private sectors. What major changes from the freight trends of the past 25 years are you expecting over the next 25 years? What are the major driving forces (e.g., time-sensitive delivery and e-commerce) behind these trends? What role does the EU have in identifying transportation system bottlenecks and in solving them? What type of data on freight volumes is collected? Who has responsibility for what types of data? How are these data used for system management decisions? Are performance measures used to monitor the performance of the transportation system as it relates to freight mobility? If so, what are they and how are they developed? Do EU members have their own transportation system performance measures as they relate to freight movements? If so, how do they relate to EU measures? What types of forecasting methods or approaches are typically used to predict future freight movement within and beyond the EU? Who does this forecasting? The EU is known as an international leader in linking infrastructure investment planning to broader societal goals relating to sustainable development, environmental quality, etc. How have such considerations been incorporated into the planning and decision making for freight facilities? How are freight facilities having international significance financed? Does the EU play a role in securing necessary financing? What types of government subsidies are provided for capital improvements and operations of freight facilities (rail, aviation, water, trucking, intermodal, etc.)? What role does the private sector play in identifying important investments? In desired policies? Or in funding projects? What intelligent transportation system (ITS) technologies have proved most useful in enhancing freight productivity in the EU? What has been the role of the EU in fostering such technology applications? What future ITS applications will receive increasing attention from government and industry? How are local, provincial, national, and international communities and groups incorporated into the planning process for freight facilities improvements that have international impacts (such as port facilities)? How is planning and implementation done for multination transportation corridors? Have increasing freight volumes led to innovative and creative uses of transportation infrastructure (e.g., freight exclusive lanes, pricing schemes, time-of-day use and bans, etc.)? How are competing interests between passenger and freight use of the transportation system dealt with (e.g., rail facilities or roads)? Do passenger railroads have a long-term strategy that includes a potentially larger role for freight movement? How does research and development on freight issues of interest to the EU get funded? Do the public and private sectors share risks in this research? Has the existence of the EU changed your country's policies or operating considerations for freight movement? What have been the trends in your governmental financing of freight-related transportation infrastructure? For example, what has been the investment history in ports, airports, inland waterways, roads, intermodal terminals, etc.? How are freight facilities that have international significance financed? To what extent does the existence of the Common Market help in securing necessary financing? What types of government subsidies are provided for capital improvements and operations of freight facilities (rail, aviation, water, trucking, intermodal, etc.)? Europe is known as an international leader in linking infrastructure investment planning to broader societal goals relating to sustainable development, environmental quality, etc. How have such considerations been incorporated into the planning and decision making for freight facilities? Are performance measures used to monitor the performance of the transportation system as it relates to freight mobility? If so, what are they and how are they developed? If so, how do they relate to EU system performance measures? How are investments in freight facilities evaluated in the context of their role in international trade? For example, are benefit/cost analyses used in such evaluations? If so, how are benefits assessed? How are freight movement considerations incorporated into the planning for major highways? What major changes from the freight trends of the past 25 years are you expecting over the next 25 years? What are the major driving forces behind these trends? What has been the effect of globalization of the marketplace on the freight industry in your country? On the freight industry in the EU? What have been the corresponding effects on your country's transportation system? On the transportation system in Europe? What effect do road congestion and transportation bottlenecks have on logistics and equipment usage? Does congestion on the road network act as a "pricing" mechanism to encourage the use of alternative modes? What types of forecasting methods or approaches are typically used to predict future freight movement? Who does this forecasting? And how are these forecasts made consistent with any that are done by the EU? What role does the private sector play in identifying important investments? In desired policies? In funding projects? What intelligent transportation system (ITS) technologies have proved most useful in enhancing freight productivity in the EU? What has been the role of our government and/or the EU in fostering such technology applications? What future ITS applications will receive increasing attention from government and industry? Have business to business (B2B) and business to customer (B2C) strategies had any impact on the location of business activities in the EU? Has the EU or any national government undertaken any policy initiative relating to "guiding" or "managing" the resulting transportation impacts of these business strategies? How has the movement of freight through your facility changed over the past 25 years (by mode, if appropriate)? Specifically, has the creation of the EU caused significant changes in freight movement and/or in the way you view your business? If so, how? What has been the effect of the removal of trade barriers and tariffs on the amount and type of freight shipped and on the method of shipment? How do differing regulatory and taxation policies among European nations affect logistics decisions? What types of access constraints do you experience at your facility? How are local, provincial, national, and international communities and groups incorporated into the planning process for freight facility improvements that have international impacts (such as port facilities)? What is your involvement in the planning for multination transportation corridors? How are investments in freight facilities evaluated in the context of role in international trade? For example, are benefit/cost analyses used in such evaluations? If so, how are benefits assessed? How are freight facilities having international significance financed? What are the respective roles of the EU? Your national government? The provincial or local government? Your agency? Specifically, what types of government subsidies are provided for capital improvements and operations of freight facilities (rail, aviation, water, trucking, intermodal, etc.)? What role does the private sector play in identifying important investments? In desired policies? Or in funding projects? What intelligent transportation system (ITS) technologies have proved most useful in enhancing the productivity of freight movement at your facility? In particular, how have such technologies been used to improve land-side access to your facility? What has been your role and that of the EU in fostering such technology applications? What future ITS applications will receive increasing attention from government and industry? How are the rapid changes in Internet-based logistics affecting the movement of freight in the EU, and in particular the freight using your facility? Have business to business (B2B) and business to customer (B2C) e-commerce strategies had any impact on the location of business activities in the EU? Has the EU or any national government undertaken any policy initiative relating to "guiding" or "managing" the resulting transportation impacts of these business strategies? What has been the effect of larger and deeper draft ships on port business? Has this effect changed the distribution of freight movement among various ports? How has rail intermodal service grown in Europe in recent history and what are the projected trends? What are the major changes occurring in the rail freight industry, and what is causing these changes? To what extent is investment occurring in inland and coastal waterway systems as (1) a distribution system within Europe and (2)as an access system to international trade centers? What are the trends in containerization versus other types of cargo moving through ports in Europe? Has the existence of the EU changed your (or your industry's) policies or operating considerations for freight movement among member EU nations? If so, how? How has it affected freight operations with non-EU nations? What has been the effect of EU policies (e.g., the removal of trade barriers and tariffs) on the amount and type of freight shipped and on the method of shipment? What do you consider to be the single biggest benefit from the EU with regard to freight operations? What do you consider to be the most significant remaining barrier to more efficient freight operations within the EU? What differences still remain and how will they be dealt with? How are these issues dealt with for non-EU-member border crossings? To what extent have various modal providers of transportation services cooperated in developing common technology standards? What has been the role of the EU or individual national governments in fostering such cooperation? What challenges has an "open borders" policy created for freight logistics? For those responsible for providing transportation facilities and infrastructure? How are freight facilities having international significance financed? Does the EU play a role in securing necessary financing? What types of government subsidies are provided for capital improvements and operations of freight facilities (rail, aviation, water, trucking, intermodal, etc.)? What role does the private sector play in identifying important investments? In desired policies? Or in funding projects? What intelligent transportation system (ITS) technologies have proved most useful in enhancing freight productivity in the EU? What has been the role of the EU in fostering such technology applications? What has been the role of industry in fostering such technology applications? What future ITS applications will receive increasing attention from government and industry? What has been the effect of globalization of the economy on your business? What has been the effect on Europe's transportation system? How are the rapid changes in Internet-based logistics affecting your business? The movement of freight in the EU? Has the rapid integration of Internet-based logistics into business decision making had any impact on the location of where business activities occur in the EU? Has the EU or any national government undertaken any policy initiative relating to "guiding" or "managing" the resulting transportation impacts of these business strategies? To what extent is investment occurring in inland and coastal waterway systems as (1) a distribution system within Europe and (2) as an access system to international trade centers? Harry B. Caldwell (Co-chair) is the Chief of Intermodal Freight for the U.S. Federal Highway Administration (FHWA) of the U.S. Department of Transportation (DOT). He advocates concerns of carriers and shippers in U.S. transport policies and programs and develops legislative strategies to enhance freight and international trade transport. Mr. Caldwell speaks frequently throughout North America on trade transportation, economic development, and institutional reform. He managed the "Strategic Investment Analysis" for all U.S. highways and bridges from 1988 to 1998. He authored the 1994 Readiness Assessment of North American transport systems for international trade. He also managed the U.S. "borders and corridors program" to enhance trade transport with Mexico and Canada. He is currently charged with developing a comprehensive, multimodal program to enhance North American freight productivity (scheduled for completion in 2002). Mr. Caldwell developed the "Highway Economic Requirements System" for infrastructure assessment as well as the "Freight Analytical Framework," a multimodal systems analysis tool to understand freight flows and analyze mitigation strategies. He is currently developing dynamic border simulation software to facilitate freight flows across North American borders. A professional geographer, Mr. Caldwell has been with the FHWA for 28 years and has been actively involved for the past several years in international affairs. He frequently represents the U.S. DOT in international policy and technical discussions. Randy Halvorson (Co-chair) is Director of the Minnesota DOT's (Mn/DOT) Program Delivery Group. This group is responsible for a broad range of planning and operational activities, including all statewide highway investments and modal programs. Recent planning efforts include completion of a statewide "Freight Flow Study." Prior to assuming his current position, Mr. Halvorson held a number of positions at Mn/DOT, including Assistant Commissioner for the Transportation Research and Investment Management Division (TRIM) from 1998 to 1999, Assistant Division Director of TRIM from 1994 to 1998, Director of the Transit Office (1985-1994), and Director of National Relations (1983-1985). He has a Bachelor's and a Master's degree in Political Science from the University of Minnesota. He is an active member of several national transportation organizations, including the Transportation Research Board's (TRB) Committee for the Study of Freight Capacity for the Next Century. Christina T. Casgar is the Executive Director for the Foundation for Intermodal Research and Education. Ms. Casgar directs the work of this nonprofit Foundation, which is a subsidiary of the Intermodal Association of North America. The Foundation addresses the interests of intermodal carriers and shippers as an information source for industry statistics, intermodal policy issues, and linking public officials with industry leaders to address intermodal challenges. Prior to directing the Foundation, Ms. Casgar was the Staff Officer for Marine and Intermodal Research at the National Academy of Sciences/Transportation Research Board in Washington, D.C. Ms. Casgar also spent 7 years working with the Port of Wilmington, Delaware. She has a BA from the University of Arizona and a Master's degree in Maritime Policy from the University of Delaware. Gene Cleckley is Director of the Federal Highway Administration's (FHWA) Southern Resource Center in Atlanta, Georgia. Mr. Cleckley has a strong background in environmental issues and is an avid supporter of the Latin American Trade Transportation Study (LATTS), a multistate initiative of the Southeastern Association of State Highway and Transportation Officials (SASHTO). LATTS focuses on multistate, multimodal analysis of institutional, operational, and infrastructure challenges at the regional level. Mr. Cleckley is involved in addressing issues of growing international trade and means of balancing needs for regional economic growth, safety, and community livability. Oscar de Buen is head of the Toll Roads Unit at the Ministry of Communications and Transport in Mexico, where he is responsible for the development of the toll road system, including its financial, operational, technical, and commercial aspects. Mr. de Buen also is responsible for nationwide highway infrastructure planning and for developing road projects for private participation. Mr. de Buen has a Civil Engineering degree from the National University of Mexico and a Master's degree in Transportation from the Massachusetts Institute of Technology. Mr. de Buen is a member of various local professional societies and has taught transportation-related subjects at several universities in Mexico. Jeff G. Honefanger is the Manager of the Ohio Department of Transportation (ODOT), Special Hauling Permits Section. This position has statewide responsibility for issuing permits for every Oversize and Overweight vehicle traveling in Ohio. This position is also responsible for all commercial vehicle activities for which ODOT has interest and involvement, including coordination with other State agencies. Prior to this assignment, he was the Deputy Director of the Division of Rail Transportation for ODOT. Mr. Honefanger has a Business degree and Paramedic Science degree from Clark Technical College and attended Wittenberg University. He is a member of the American Association of State Highway and Transportation Officials (AASHTO) Subcommittee on Highway Transport, and he chairs the AASHTO National Oversize/ Overweight Vehicle Issues Task Force. Mr. Honefanger also serves on the Ohio Governor's Motor Carrier Advisory Committee, Multi-State Permit Group, Ohio Commercial Vehicle Information System Network (CVISN) Committee, Great Lake States CVISN Mainstreaming Group, and the Multi-state Permit Group. Ysela Llort is the State Transportation Planner for the Florida Department of Transportation. In her capacity as chief planner she oversees the statewide systems planning functions for the Florida DOT. Primary responsibilities include executive-level policy formulation and interpretation as well as working with the numerous transportation planners, including metropolitan planning organizations, to obtain consensus on the needs and priorities of the state. Ms. Llort has been with the Florida DOT since August of 1994. Prior to her work there she served 9 years with the Virginia DOT as Assistant District Engineer for Planning and Operations in the northern Virginia portion of the Washington, D.C., metropolitan area. She has worked in both private and public sectors, including in developmental banking. Ms. Llort is a graduate of Duke University where she earned a degree in economics. She has a double Master's degree from Clemson University in City and Regional Planning and in Transportation Engineering. Michael D. Meyer (Report Facilitator) is Professor and former Chair of Civil and Environmental Engineering at the Georgia Institute of Technology. From 1993 to 1998 Dr. Meyer was Director of Transportation Planning and Development for the state of Massachusetts where he was responsible for statewide planning, project development, traffic engineering, and transportation research. Prior to that he was a professor in the Department of Civil Engineering at the Massachusetts Institute of Technology (MIT). Dr. Meyer has written more than 120 technical articles and has authored or co-authored numerous textbooks on transportation planning, policy and education; environmental impact analysis; and intermodal transportation. Dr. Meyer received his Bachelor's degree in Civil Engineering from the University of Wisconsin, a Master's degree in Civil Engineering from Northwestern University, and his Ph.D. in Civil Engineering from MIT. He is a registered professional engineer in the State of Georgia. R. Leo Penne is Program Director for Intermodal and Industry Activities with the American Association of State Highway and Transportation Officials (AASHTO). He is responsible for issues involving freight transportation by all modes - rail, truck, aviation, ports, and waterways - and for liaison with industries having significant interests in freight movement. He shares the responsibility for developing and communicating the case for the economic benefits of transportation and for demonstrating the linkage between transportation and economic development. Mr. Penne has initiated and carried out programs for advocacy, policy development, and research in areas such as transportation, economic development, urban development, environmental protection, public finance, training, and tourism, and has written and edited books, reports, and articles on these subjects. He has held positions dealing with issues of strategy and policy analysis for the State of Nevada, the U.S. Department of Commerce, and the National League of Cities. He holds degrees in Political Science from Seattle University and the University of Washington and has served as an adjunct faculty member at the University of Maryland Baltimore County. Gerald Rawling is the Director of Operations Analysis with the Chicago Area Transportation Study (CATS), which focuses on freight/intermodal research and planning. In his current position he has responsibility for developing and directing the freight mobility program. Mr. Rawling also has been involved in the development of freight-related initiatives with several regional agencies, civic interest groups, etc., and has supported similar initiatives at universities in the Chicago region. He has 25 years of experience in the areas of freight mobility, regional freight planning and operations analysis, and intermodal studies. Mr. Rawling is published widely and has made numerous presentations before most regional and national associations representing the freight industry. He was co-author of a paper, "Mainstreaming Intermodal Freight Into the Metropolitan Transportation Planning Process," which was the winner of the Transportation Research Board's 1998 Pyke-Johnson award. Garry Tulipan is Acting Director of the Motor Carrier Policy Branch of Transport Canada. In that position he helps develop and implement motor carrier policies for Canada and NAFTA. Prior to this, he was Chief of Surface and Marine Statistics and Forecasts, Economic Analysis Division. Mr. Tulipan also served 16 months as special consultant at the Organisation for Economic Co-operation and Development in Paris. He holds a BA in Economics, a BS in Social Science, and an MBA, all from University of Ottawa. (MS 120) 395 John Ireland Blvd. 1 The EU receives its revenues from four major sources: 14 percent of the revenue comes from levies on agricultural products from non-member countries and from customs duties; 35 percent comes from a VAT on goods sold; and the remainder comes from a percentage contribution from each member country reflecting its relative gross national product (GNP). 2 The countries seeking membership include Bulgaria, Cyprus, the Czech Republic, Estonia, Hungary, Malta, Latvia, Lithuania, Poland, Romania, the Slovak Republic, Slovenia, and Turkey. 3 Ministry of Transport, Public Works, and Water Management. 2001. National Traffic and Transport Plan for the Netherlands, 2001-2020. The Hague, the Netherlands. 4 European Commission. 1998. Green Paper on Sea Ports and Maritime Infrastructure. Report C3-16-98-740-EN-C, Luxembourg.